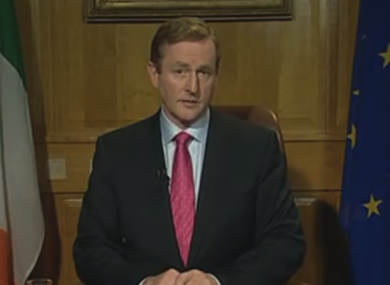 "Nothing to see here"- Enda Kenny addresses the nation. Today is the day when payment for the worst of the excesses of the Celtic tiger falls due. Today, Brendan Howlin will stand up in the Dáil and tell the poor, the sick and the old in Ireland not why they have to pay the debts of the bankers, but how. And how much. This should come as no surprise- after all, we voted for it. As I wrote the day before the general election in February, a vote for Fine Gael or Labour was a vote to accept these debts as our own. The cuts today in euros and cents will hit hardest on those who can afford it least, the rises in taxes tomorrow will do the same, and the words about how those who were responsible for the crisis would pay for it will ring as hollow as they ever did. Enda Kenny’s address to the nation last night can be summed up in one word. When it was most needed, he offered neither hope nor leadership. Often, he offered his unique brand of patronising stupidity. “Difficult decisions are never easy”. But we’re paying for it Enda. Not the bankers, or the banks. The citizens. Often poor, unemployed, old, sick or children. To paraphrase Charles Haughey’s similar address thirty years ago, Enda’s speech could be summed up as follows: “we are living beyond your means”. He and his government have offered nothing in the way of new thinking – no spark that would or could inspire the public, the entrepreneurs, the hard-working lucky enough to have work. Never has so little been achieved by so many. At a time when our corporation tax rate is under threat, no-one has thought to threaten to cut it to stimulate jobs and create growth. No-oner has thought to make an industry out of caring for our old and our sick and our young by offering them the care and dignity they deserve. No-one has thought to leverage Ireland as Europe’s English-language service provider in accounting or human resources. Instead, they’re going to take Bertie’s mobile phone off him- something which might have worked to save Ireland ten years ago, but won’t help much now. Keep this in mind when Brendan Howlin stands up in the Dáil today and hands the bill for the banks to your children.